Download iOS 7.1 Beta – Apple has rolled out the first beta of iOS 7.1 to developers this morning. The iOS 7.1 beta 1 is available to download via iOS Dev Center. The download links for iOS 7.1 beta 1 will be available right now on our download page, and as well as in iOS Dev Center. Apple has been working on the iOS 7.1 alpha builds from last couple of weeks, and now has finally revealed the major update in front of developers to make it more stable and working. The iOS 7.1 beta 1 download is currently available only to developers, but if you are hanging with us then you will get direct download iOS 7.1 beta 1 for your iOS devices. 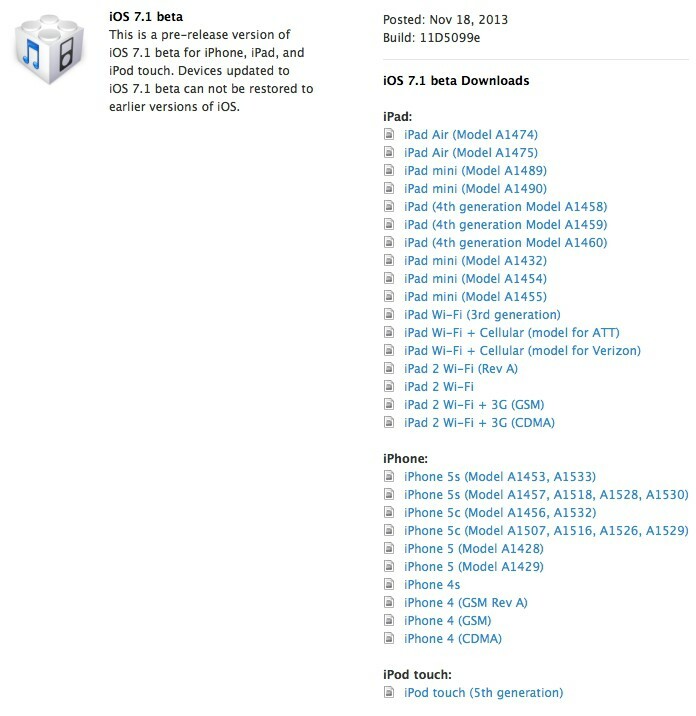 Apple has released iOS 7.1 beta 1 download update for all range of iOS devices. The list also includes the latest launched iPhone 5s, iPhone 5c, Retina iPad Mini, and iPad Air as well. Users can download iOS 7.1 beta 1 on their iOS devices using direct download links and as well as by signing into iOS Dev Center. It is merit mentioning here that iOS 7.1 beta 1 download is only meant for developers, and expert iOS users who are ready to face new issues and bugs on their iPhone or iPad devices. The iOS 7.1 beta 1 comes with the build number 11D5099e. ▪ instead of saying ‘No Missed Notifications,’ it now just says ‘No Notifications’ when NC is cleared. Register your device UDID with iOS Dev Center. Download Latest iOS 7.1 Beta for your device. Make sure you are on the latest version of iTunes. Connect the iPhone to the computer and perform a complete backup with iTunes. Open iTunes and upgrade to the iOS 7.1 Beta by choosing Check for Update. • Be sure to hold alt/option on Mac when you click Check for Update. • On Windows, hold Shift when you click Check for Update. Find the .ipsw file you downloaded and select it.